Nike goddess of Victory was the daughter of the titan Pallas and of the goddess Styx. In fact, she represented the personification of victory, both in war and in pacific competitions. Her Roman name was Victoria. There are no specific myths concerning her. Anyway, there is a story about her mother, Styx, who brought her four children: Nike (Victory), Zelus (Rivalry), Bia (Force) and Kratos (Strength) as allies for Zeus in his war against the Titans. They became the sentinels of Zeus, while Nike goddess of Victory was the charioteer. For their help, Nike and her siblings were allowed to dwell forever in Zeus' household. When the monster Typhoeus attacked mount Olympus, all the gods fled and Zeus was left alone. Only the goddess Nike came to encourage him to continue the battle, least the order of the universe should be destroyed. She armed him and helped him in battle, by holding a shield in front of him. At the wedding of Cadmus and Harmonia, she danced and sang beautifully. In many Greek sculptures, she is represented as a winged woman, on a chariot. Very often she holds a wreath or a palm leaf in her hand or she crowns a winner. She appears often with Zeus and Athena or with various heroes. 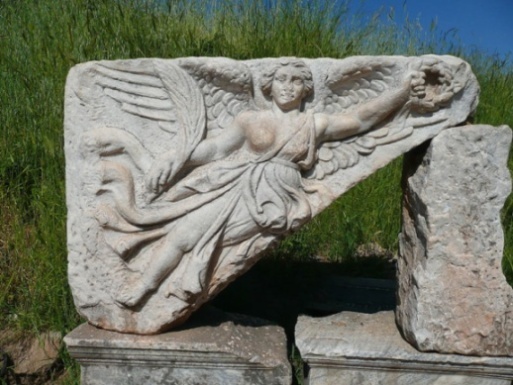 Sometimes, Nike was represented as a friend of the Greek goddess Athena, however in Athens this was just another name used for the goddess of wisdom. The following statue is one of the most well-known representations, the so called Nike of Samothrace or Winged Victory. For pictures of Nike goddess of Victory, click here.